LAS VEGAS — The wine list at Gordon Ramsay’s Steak restaurant changes so frequently, the servers need iPads to keep up. The wait staff at the Englishman’s massively popular restaurant are armed with 20 iPads to take wine orders. Not only does it save paper, it’s the only way to make sure the ever-changing wine list is accurate. Not only do the sommeliers love it, the customers do too. Celebrity chef Gordon Ramsay’s namesake restaurant opened on May 7th of last year. Now that the iPad wine system has been in use for several months, we checked in to see how it is working. I spoke to Steve Quenzer, a sommelier at the restaurant. He was friendly enough to fill me in on how the iPad ordering works. With a selection of 450 wines on the wine list (the bottles are stored in five different locations), the restaurant needs iPads to keep up. The two sommeliers on staff can offer suggestions to customers, but it would take far too long to go over the extensive list with each one. That’s where the iPad comes in. When customers sit down, they are handed an iPad to peruse the wine list. There are twenty iPads on the restaurant floor at all times. The iPads are running an app called Smart Cellar by Incentient. The app offers different ways for customers to choose wines interactievly. Customers can peruse wines by type: red, white or sparkling; or they can search for a specific brand of wine. The app is illustrated with lots of pictures and tasting notes. I thought this was a brillant analogy and I appreciated the food reference. 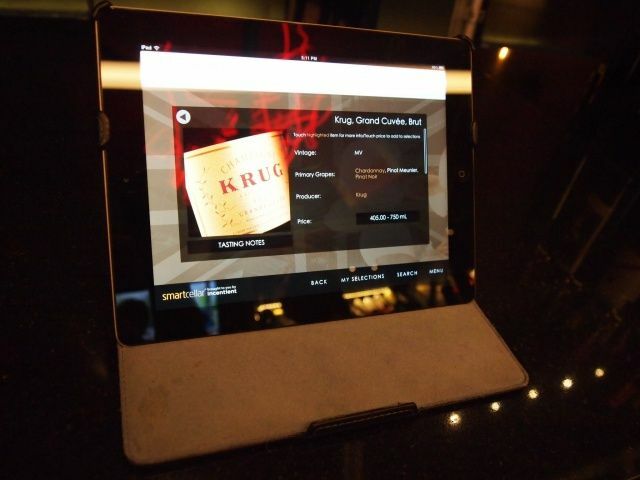 Gordon Ramsay Steak is the first in the Caesars Entertainment group to use the Smart Cellar with the iPad. Since May, Ramsay has opened two more restaurants in Vegas and although they are not as fancy as Steak, they also iPad-powered wine lists. I can’t imagine how Gordon has time to sleep with all of his restaurants and television shows but Steve told me that he comes into the restaurant once a month to check in. Unlike his TV personality, he is not a jerk. In fact, he is very pleasant. Besides wine, the iPad has other beverage options, including cocktails. An interactive cocktail menu lists the ingredients and prices of the restaurant’s eight signature cocktails and beers. The customer simply selects the beverage of their choice and adds it to a shopping cart. I noticed that one glass of wine cost $40, so this can easily become one expensive shopping cart. Although the wine list is interactive, the food menu is still paper. The food also changes, but there aren’t as many choices and it doesn’t change as often as the wine. What never changes is the steaks. The most popular item is Ramsay’s signature Beef Wellington because customers have seen it on TV. Ramsay’s Steak is one of the most popular restaurants in his chain of 25 eateries worldwide. Over the summer it was his number one restaurant. iPad ordering is the future, according to Steve. It is environmentally friendly and very green. The wine list is constantly changing and evolving. If a vintage changes or they run out of a specific brand, the iPads reflect these changes in real time. The biggest advantage is that its 100 percent accurate at all times, said Steve. Before the iPad, when paper menus were used, new menus would be printed up daily to reflect these changes. The iPad is saving the restaurant $50-$75 a month in paper costs alone. Most of the customers are receptive; Steve estimated that about 90 percent like it. A few old school types miss holding a good, old paper in their hands — but you can’t please everyone. My advice? Relax and have a drink — if you’re able to make up your mind.